After much deliberation this afternoon, it was decided that my daughter, her boyfriend and I would watch Walt Disney’s Wreck-It Ralph (the 3D version) at the cinema. It was close though, I was holding out for A Good Day to Die Hard but after a little discussion about how Ralph was really a film for gamers, which I am, I went with the mass consensus of two to one. I got so into the film that not even the kid’s feet behind me bashing into my seat could take me out of it. I did expect to see a few more characters from the “arcade-style” game world; there was mention of Super Mario, but no sign of him, but I was not bothered about the lack of what I expected to see. Directed and co-written by Rich Moore (along with an amazing 6 other ‘credited’ writers, probably the first time I’ve not seen a “too many cooks spoil the broth” in films) Wreck-it Ralph follows the story of Ralph as he tries to change his very nature and standing in the game he’s a part of. 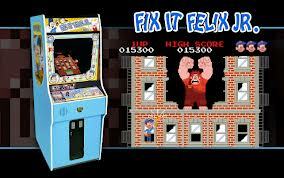 The game is actually called Fix-It Felix, Jr. and it has been a firm favourite at Litwak’s Arcade for 30 years. But Ralph is tired of being a ‘bad guy’ and he has joined a Bad Guy Support group that he’s talking to at the beginning of the film. He tells the group that he’s tired of Fix-it-Felix, Jr getting medals and pies and being loved by all the other characters in the game. When he returns after his ‘bad guy’ session he see’s that all the characters have thrown a party, without him. Ralph’s world and his cross to bear. After “gate-crashing” Felix’s 30th anniversary party, he decides he’s going to get his own medal. He takes a character’s uniform from the first-person shooter game Hero’s Duty so he can win a medal. After discovering that this game is nothing like his, he learns where a medal is from the rough-tough Sgt Calhoun. Once he gets the medal, he’s attacked by a “Cy-Bug” and when he escapes, the Cy-Bug escapes with him to the racing game Sugar Rush. When Ralph (and the bug) land in Sugar Rush the story takes off as he helps Vanellope win her race and finds out if he really is a good-guy in a bad-guy’s role. 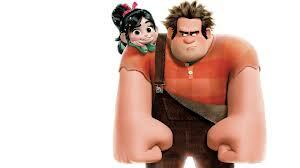 John C. Reilly could have been born to voice Wreck-It Ralph. There is no other actor that I can think of who could have brought him so brilliantly to life. He has the right sort of pathos and misery to his voice to make you really pull for Ralph as he searches for his ‘real’ calling in the game world. Jane Lynch as Sgt Calhoun from Hero’s Duty absolutely rocks it as the tougher than nails space trooper who has a sadder-than-sad back story. The real joy of the film’s casting (besides Reilly) was Sarah Silverman as Vanellope and Alan Tudyk (from Firefly/Serenity) as King Candy. Silverman enchants and amuses while she tugs at your heartstrings and Tudyk does the best Ed Winn impression in the world. Incidentally if you don’t know who (the late) Ed Winn was, just check out Uncle Albert in Mary Poppins. Vanellope and Wreck-It Ralph. Sarah Silverman and John C. Reilly. 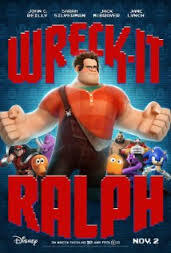 Considering that the main character’s name is Wreck-It Ralph, it will come as no surprise that there is a whole lot of destruction going on in this delightful film. And I’d be lying if I said that I wasn’t tearing up with a huge lump in my throat as the film reached its climax. Gamers will love the film and small children will enjoy it, but, not as much as the older gamer’s in the crowd. The 3D version was very good and you felt at times like you were right in the middle of the action. Great stuff that will appeal to the “big-kid” in us all. If you see it in the cinema, you’ll also get a chance to see the award-winning animated short Paperman. My final verdict is a full 5 out of 5 stars, mainly because the interaction between Vanellope and Ralph made me laugh and almost cry. Add Felix, Jr’s (Jack McBrayer) total infatuation with Sgt Calhoun and you have a really funny bit of romance in the game-verse’s air as well. If you love gaming, don’t miss this film. Sgt Calhoun, Commander Shepard’s ethereal twin.